'Aoccdrnig to rscheearch at Cmabrigde Uinervtisy, it deosn't mttaer in waht oredr the ltteers in a wrod are, the olny iprmoetnt tihng is taht the frist and lsat ltteer be at the rghit pclae. Well that is all very well but our clients require our candidates to be fast, accurate and to have fantastic attention to detail. 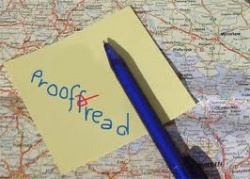 As a result we have a proof reading test to give us, and our clients, some idea as to how thorough you can be.